It’s almost 10 years since my first visit to the US. People often say that the first impression is the most important one. It’s especially true in the case of USA as it is a country about which most of visitors have strong opinions. People like it a lot or often hate it, but few stay neutral or don’t really care. I was lucky in a way that the first state I visited was sunny Florida and specifically the Orlando area. Most people when they hear Orlando probably automatically think about the Disney World. Yes, I did visit it. In fact I worked there for about three months. I can already see some people shaking their heads in despair but there is no need guys, it was really great summer. But let start from the basics. 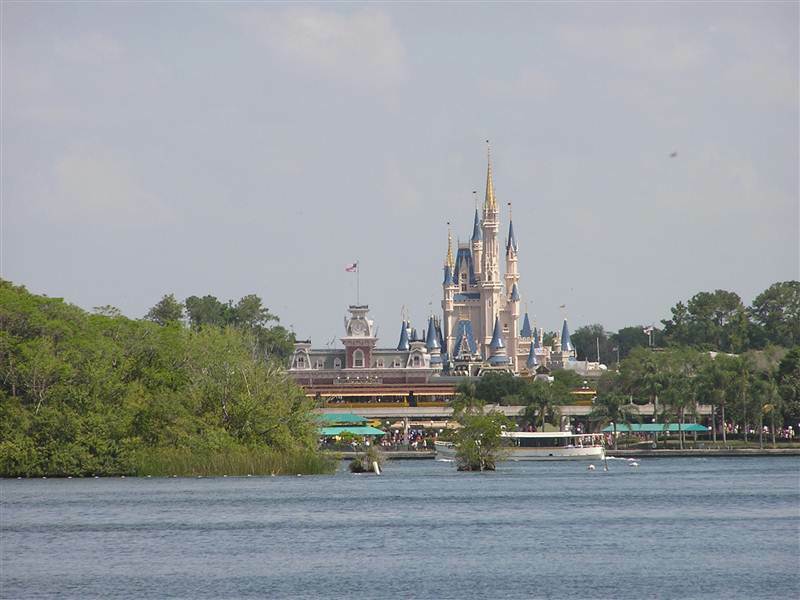 The Walt Disney World (WDW in short) is one of the biggest tourist attraction in the US. Most people associate it with Magic Kingdom, full of all the classic Disney characters and with its iconic Cinderella castle dominating the skyline. In fact Magic Kingdom is the most visited amusement park of the world, with over 17 million visitors a year, but WDW is much more than that. It is an absolutely massive complex covering over 120 square kilometres (roughly area the size of San Francisco) with its own power plant, landfill and transportation system. Disney runs whole bunch of bus lines, some for staff only some for visitors. In fact its bus system might well be larger than the one operated by the city of Orlando. There are four big amusement parks, two water parks, a large shopping area, baseball stadium and even a racetrack. Yes, there is a 1.6 km tri-oval speedway. The whole place employs over 65000 people during the summer peak season and I was one of them. Job wasn’t particularly good or bad, typical summer fast food stint during university. But it had some perks like free unlimited admission to all the Disney operated attractions. What was also fun, was living in a large international community of summer workers with literally thousands of students from around the world. In short it was something like a massive campus but with no exams, just a lot of parties. I shall stop here (to avoid some graphic party details) and move to describing places especially worth visiting. Because one thing you have to accept is that you have to be selective. Unless someone has as much time as we had spending there the whole summer, it is virtually impossible to visit all of the Orlando attractions. Magic Kingdom is probably the most visited place in Orlando, if not the whole Florida. Of course it is geared towards the kids, the rides are tame, other attractions miss any specific wow factor and the whole place has a bit dated feel. But you shouldn’t miss it, even if you have just few spare hours in some afternoon, as it offers possibility of going back in time to your childhood. Parades of characters might look a bit kitschy, but what the hell, where else can you meet Mickey or Donald Duck? I also really recommend attending evening fireworks show. Especially for non-Americans it can be substitute of the 4th of July as the show goes on every day. And believe me, technicians in Disney know how to put up a good show. Next of the WDW parks is EPCOT which is acronym for “Experimental Prototype Community of Tomorrow”. I have to say I find it a weird attraction, split into two distinctive parts. The worse part of it contains group of pavilions which supposedly showcase achievements of the humanity and is called “Future World”. Unfortunately, they were, and some still are, sponsored by the big companies and offer more of unashamed and cheap advertisement than anything educational or even fun. Some of them are also quite dated and in the modern age of smartphones and other gadgets are not that impressive at all. Much more interesting part of EPCOT is the World Showcase. It is group of 11 pavilions representing: Mexico, Norway, China, Germany, Italy, USA, Japan, Morocco, France, United Kingdom and Canada. Some of them contain shows or rides but they are not especially exciting or interesting. So what I like about them? In short: food, drinks and general atmosphere. Each country pavilion offers taste of its cuisine, usually in budget and more fancy options, as well as some genuine shopping. What makes the whole experience even more fun is fact that many employees are native to the particular country; they are usually students on work placement programs. If you stay until the closing time there is really good sound, light and fireworks show. I was always impressed even when I saw it dozens of times. 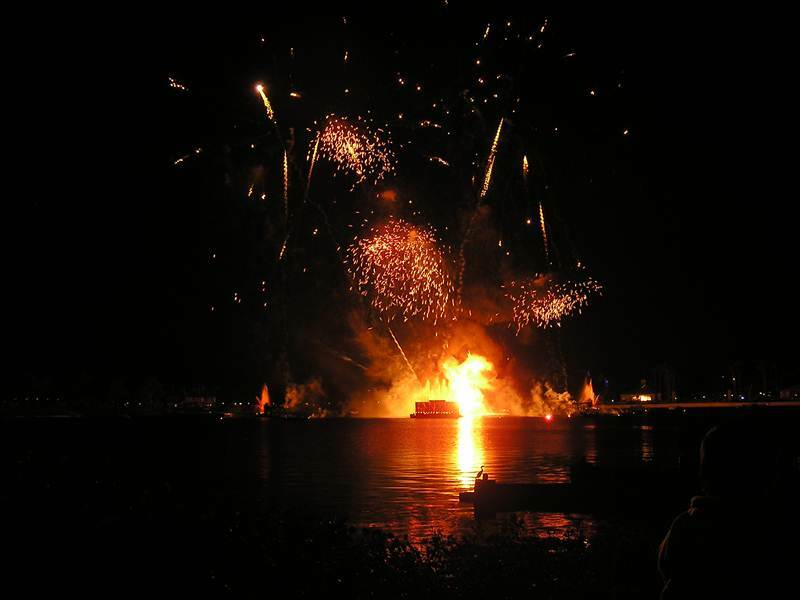 And on 4th of July Disney prepares really amazing, nearly half an hour extravaganza. Crowds will be enormous but it’s something you shouldn’t miss if you in the Orlando area at this time of year. Disney’s Hollywood Studios, third of the main parks, is probably the most similar to a classic amusement park and offers two rides which I strongly recommend. First of them is Rock ‘n’ Roller Coaster Starring Aerosmith. The whole experience starts pre ride when you visit “studio” where Aerosmith invites you to their limo. It’s all cleverly done as the big screens give impression that you really see the band behind the soundproof glass of a studio. You then get strapped in the vehicle and enter the darkness (it is an indoor ride). Now the real fun begins, with music blasting from the speakers (five for each seat), the vehicles accelerate from 0 to 60 mph in 2.8 seconds. It let you experience force of 4.5 g when you enter the first of three inversions. It is actually more than during the space shuttle launch but of course for much shorter period of time. In my opinion it is by far the best ride in the whole WDW complex. The other ride at the Studios I recommend is The Twilight Zone Tower of Terror. In short, it is drop tower thrill ride where at one point you can experience weightlessness. I won’t spoil your ride by describing the details but believe me, it is good. Fourth of the WDW parks is Animal Kingdom. In short it is mix of an amusement park and a zoo. It is probably the best park to spend really hot day as it offers more greenery than the others. Overall it is probably my favourite part of WDW, even if according to the statistics it is also the least visited one. The most popular attraction there, one which you definitely shouldn’t miss, is Kilimanjaro Safaris. No, it’s not another fancy named roller coaster, it really is a safari. After boarding big trucks you will be driven in an open space between African animals including elephants, hippos and lions among others. At some point you even join a chase for poachers. In Asian section you walk instead, among fake (but nicely arranged) ruins of maharajah palace, separated from tigers and other animals by clever system of moats in some places or glass fences in others. Another hit ride is Dinosaur which is in fact mix of roller coaster, 3-D cinema and who knows what else. In recent years Disney introduced more rides into Animal Kingdom but it happened since my last visit. Best time to visit is morning or late afternoon when animals are more active and queues are shorter (especially to the extremely popular safari ride). As I mentioned before WDW offer more than its classic parks. There are two water parks: Typhoon Lagoon, where the biggest attraction is massive pool with artificial waves, and Blizzard Beach where main attractions are some pretty crazy slides. The tallest and the fastest one, called the Summit Plummet, is damn right scary. I did go down once but only because after 45 minutes of queuing it was stupid to back down using the staircase. Apparently you accelerate up to 50-60mph in few seconds. I remember only blasting down in milliseconds. WDW also offers shopping and eating area called Downtown Disney. Shops are actually quite diverse, from the largest Disney Store on the planet to the Harley-Davidson Orlando. Among the restaurants are the well known Planet Hollywood and Rainforest Cafe but also some others I never heard of. There used to be quite a few nightclubs as well but according to the Disney website they closed them down to redesign (read civilize) the area which used to be called The Pleasure Island. Pity, we had a lot of fun there during the staff days, or I should rather say nights 😀 Fortunately nearby House of Blues remain open and according to the web they still run Service Industry Nights (aka SIN) on Sundays, when Disney employees enter free of charge. It’s another place I have great memories from. Disney is fun but it’s not my favourite attraction in Orlando. My choice would be either Sea World or Island of Adventure at Universal. 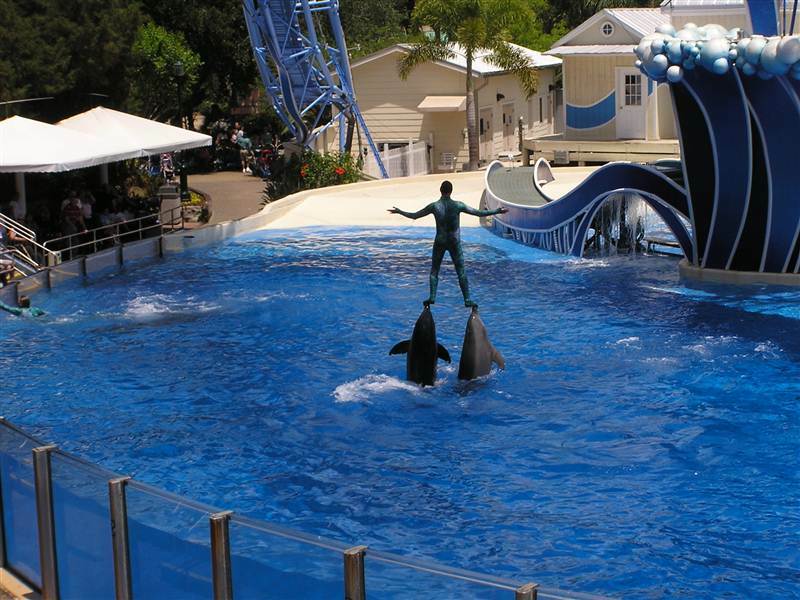 Sea World is well known for its shows featuring orcas, dolphins and other sea creatures. Even if you have attended similar shows somewhere else don’t skip this park. Here shows are really well designed and executed. If you never attended such attraction it is a must place to visit during your stay in Orlando. 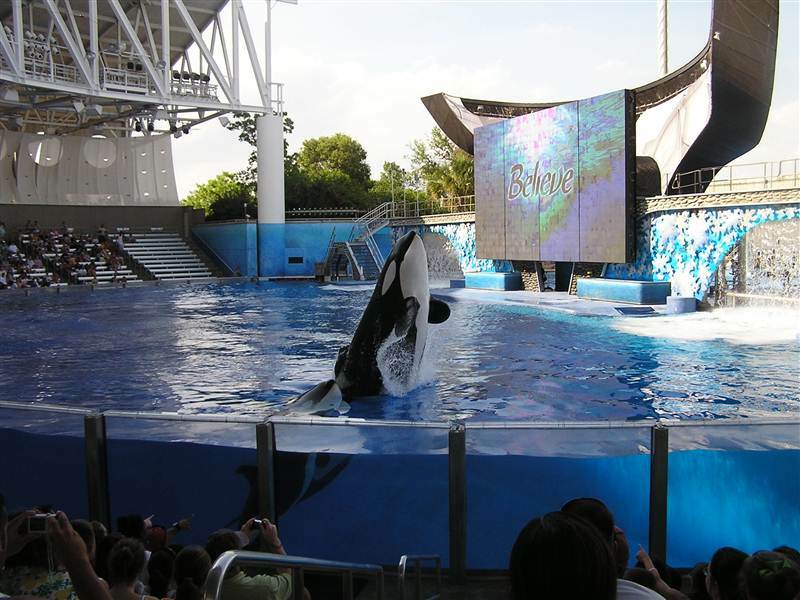 The most popular part of the Sea World is large orca stadium which seats few thousand people and where you can watch these magnificent animals in action from up close. Orcas are much bigger than they appear on TV, believe me, just remember that if you seat in first few rows (something I strongly recommend) you will get wet. There is a good reason why they call them “splash zone”. Dolphin shows are somehow less exiting but probably more fun as the stadium is smaller and the whole show is designed more to be fun than spectacular. Don’t take me wrong it is still absolutely amazing, just in a different way than the orca shows. The funniest shows of all involve seals and sea lions. Another popular corner of the SeaWorld is area where at certain times of day you can feed the dolphins. All you have to do is buy a little tray with fish for few bucks. It is surprisingly rewarding activity, dolphins come really, really close and you can even touch them. There are also rides in Sea World, including the tallest roller coaster in Florida, the Kraken. At least it was the tallest one when I visited Orlando last time. It’s fast and furious ride which I really love. In general. 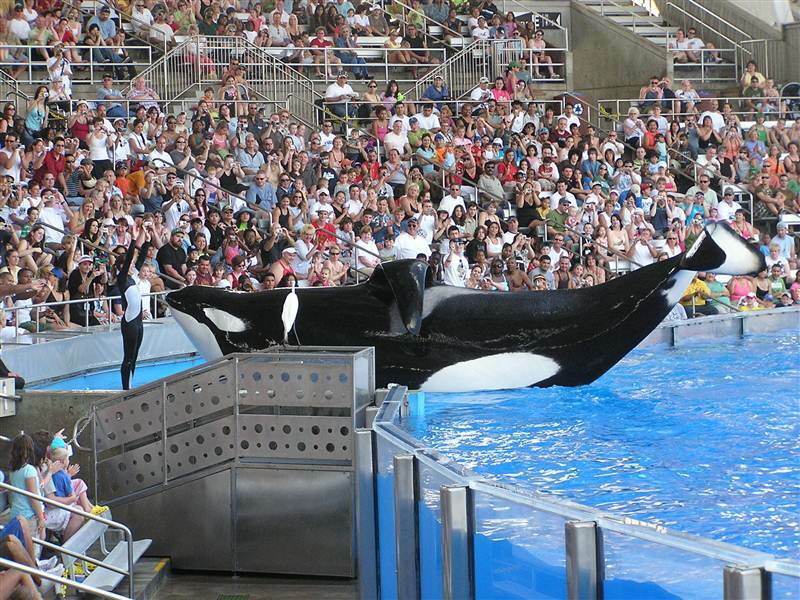 SeaWorld is great place to visit even for someone who don’t really like the idea of an amusement park. You might hate all the Disney characters, you might have locomotion sickness and hate roller-coasters but it is really difficult to resist power of the amazing animals they have in here. Even if parts of the shows might be a bit kitschy you will be impressed. Believe me. If not, you can call me a beetroot. If you are looking for some really fun rides The Island of Adventure at Universal is the place to go. And there is one particular ride which is my favourite in Florida. The Duelling Dragons. In fact there are two inverted steel roller coasters (two dragons called Ice and Fire) running simultaneously at two separate tracks but entangled together. In some places you are just few feet apart from the other Dragon. It really feels like you are flying just inches away from some obstacles and from the other roller coaster. I really recommend queuing in special (unfortunately longer) line for the front row seats as they are worth every extra minute of waiting. The first drop will simply take your breath away and at some point you will ride on a collision course with the other dragon before entering inverted loop in the last moment. It is one (or actually two in one) ride in Orlando which no one should miss. Other popular rides are: The Hulk, where you shoot out from the dark interior into the open track accelerating from 0 to 50mph and turning upside down in the same time, and The Spider Man which is indoor ride, cross between a roller coaster and cinema. It creates really great illusion but for me nothing really beats the Duelling Dragons. Recently it was actually renamed the Dragon Challenge and became part of the Harry Potter area of Universal. Fortunately, according to internet resources, it didn’t affect the ride itself. In general Orlando is much more interesting place than I have imagined before my first visit. All I knew was that there is Walt Disney World, some sort of place for kids. It turned up that WDW is not only for kids and that there are many more attractions for everyone in the Orlando area. Most people see all this place during a mad week or two. I can imagine it can be really tiring holiday, one which justify another holiday afterwards just to rest. I was lucky to be able to see and appreciate it at much slower and leisurely pace. And one of the best aspects of that summer was ability to see how such complicated complex like WDW works from the inside. It is an one well oiled machine. This entry was posted in Uncategorized and tagged Animal Kingdom, Disney's Hollywood Studios, EPCOT, Florida, Islands of Adventure, Magic Kingdom, Orlando, Rock 'n' Roller Coaster Starring Aerosmith, SeaWorld, Walt Disney World on May 30, 2011 by admin.